It is a sad reality of any publically-funded heath service that there is always more that could be done if only there were sufficient finances. This short video by Medical students at the University of Leicester, raises some of the different tensions facing those who need to make decisions about the allocation of resources. Whose cells are they anyway? In hundreds of research labs around the world, including within my own Department, scientists carry out experiments using a human cell line known as “HeLa”. Most cells die after a defined period of time, but mutations within the HeLa cells have allowed them to continue dividing outside of these normal contraints, and as such they are said to be “immortal”. 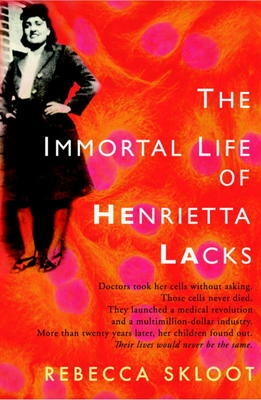 The original tissue sample from which HeLa cells are derived was taken from the cancerous cervix of an African-American woman Henrietta Lacks (the name of the cell line being an abbreviation of her name). The Immortal Life of Henrietta Lacks, a captivating account of the human story behind these amazing cells, has recently won many plaudits, including the prestigious Wellcome Trust Book Prize. Private Practice: Acting ethically at the Wellness Center? (Warning – contains plot spoilers!) Private Practice is a spin-off from Seattle hospital drama Grey’s Anatomy in which Dr Addison Montgomery (Kate Walsh) moves from Seattle Grace to join the staff of the Ocean Wellness Center in Los Angeles. I have to admit that I tired of Grey’s Anatomy during Season 1 and although I was aware it has spawned another series I had no desire to watch. All this changed, however, following an excellent talk on the programme, given by Dublin Doctor Audrey Dillon at the 4th Postgraduate Bioethics Conference (Belfast, June 2009). The writers of Private Practice, headed by Shonda Rhimes, have made a conscious decision to incorporate ethical issues into the storylines (see ‘Private Practice’ explores bioethics questions). This means, therefore, that the series may well throw up some interesting case studies as discussion starters. At the time of writing, Living TV (UK) has just started transmission of Season 2 (see here for Episode guide). A Family Thing, the first programme of the series, was aired on 25th June 2009 (TRILT code 00FC042B). True to promise, it contained two subplots featuring ethical dilemmas. Saviour siblings – a donor by design? In the first (starting 7 minutes in), Molly and Eric Madison present at the clinic demanding that the staff deliver their baby daughter that day, despite the fact that she is only 27 weeks gestation. The girl, it transpires, has been conceived following Pre-implantation Genetic Diagnosis, to be a ‘saviour sibling’ for her older brother, Jason. The boy has leukaemia and has had his own bone marrow wiped out in preparation for a transplant from a donor who has now fallen unwell with pneumonia. He is therefore immunocompromised and urgently needs umbilical stem cells courtesy of the new child. The most recent episode of Holby City is available to view of download on via the BBC iPlayer. Following on from the recent BioethicsBytes post Holby City – “If you can’t look after yourself, then why should we?” (published on January 21 2009; updated February 4th 2009), which concerned ethical issues in NHS resource allocation as highlighted by two episodes of the BBC1 drama Holby City, this update post covers events in more recent episodes of Holby City – including the denouement to the storyline, as depicted in Feet of Clay. The storyline concerns the “zero tolerance” policy implemented by Head of Surgery, Dr Ric Griffin (Hugh Quarshie), who is refusing to authorise surgical procedures for patients whose lifestyle choices may have contributed to their illness. Previous posts have covered the instigation of this policy in the episode Just (first broadcast on BBC1 on January 20 2009, at 20.00; TRILT Identifier: 00D15A4E), and the events and debates this creates between the characters in Tough Love (first broadcast on BBC1 on February 3 2009, at 20.00; TRILT Identifier: 00D8E505). This post notes relevant events in the subsequent episodes Trust, Truth and Mercy, and Take Her Breath Away, and the closure of the storyline in Feet of Clay. You are currently browsing the archives for the Clinical ethics category.